When Will I Get My French Fold Newsletters? 5,000 and under French Fold Newsletters: Ships or ready for pick up in 2 business days from proof approval. Over 5,000 French Fold Newsletters: Ships or ready for pick up in 5 business days from proof approval. Ou la la! 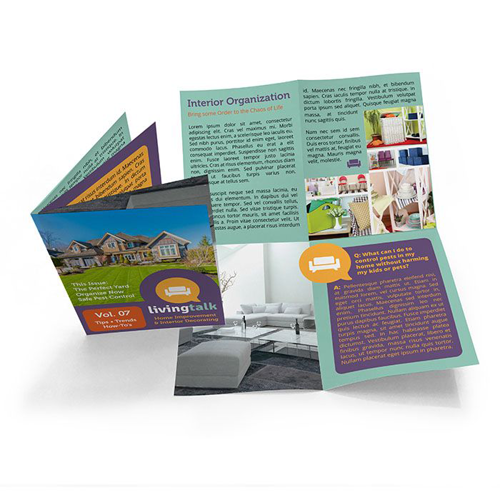 French fold newsletter printing can give your newsletter a fashionable new look. Use the online newsletter printing services of 48HourPrint.com to take advantage of high quality french fold newsletter printing at very affordable prices. And you also get the benefit of our industry-leading 48 Hour Turnaround Guarantee for quantities of 5,000 or fewer newsletters. French fold newsletter printing creates newsletters with a special mystique. These newsletters fold to compact sizes for easy mailing or hand delivery and open up to a world of design possibilities. Be creative and have fun in presenting messaging and full-color graphics that flirt with readers for their attention. French fold newsletter printing can give your staid-looking newsletter a high fashion makeover! Our high quality newsletters are printed on 100# text stock with your choice of gloss coating, high-gloss UV coating, or matte coating. In addition to our french fold newsletter printing services, you can also choose from no fold newsletter printing, single fold newsletter printing, tri-fold newsletter printing, double parallel fold newsletter printing, accordion fold newsletter printing, roll fold newsletter printing, and gate fold newsletter printing. We have newsletters covered! Review our newsletter templates for layout guidelines that will help keep your print job on schedule.